Ruff and Tumble&apos;s Drying Coat dries your dog in minutes and takes the hassle out of managing wet dogs. Imagine a car that isn&apos;t mud splattered and whiffy, or a kitchen without a heap of smelly, damp towels. Simply slip a Ruff and Tumble Drying Coat over your wet dog, fasten around the belly and neck with easy-to-use Velcro, and your job is done. The drying robe dries a dog quicker than you can and does all the work for you. Two layers of absorbent towelling wick away wet from your dog, and the soft cotton is comfortable and cosy for them to wear. No shivering in the back of the car, no wet dog smells, and no endless rubbing down. 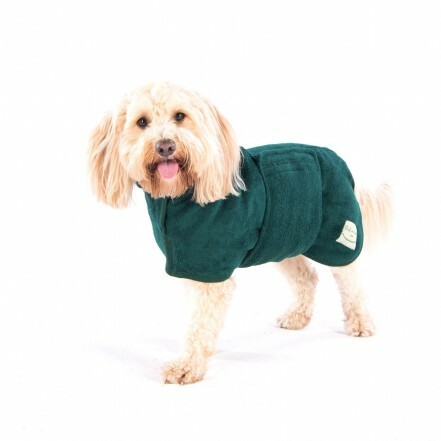 • Ruff and Tumble Drying Coat are the only coats that have an extra deep collar - simply fold up to make a hoody that dries the ears and the head. • Every Ruff and Tumble Drying Coat comes with a handy storage bag that is completely FREE. • Long adjustable collar/hood for drying soggy ears. • Breathable double thickness natural cotton towelling for super fast wicking and comfort. • Adjustable velcro means no bulky uncomfortable buckles or ties for added comfort. • Super wide belly flap covers the underside. • Extra long fit for maximum coverage.